Where to stay in Hot: Our selection of 1 guesthouses and hotels. 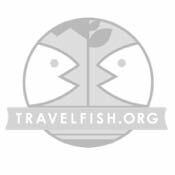 - Travelfish.org. Few people opt to stay in Hot, but there is accommodation available. A couple of motel-style spots are found south of the town, with the pleasant and comfortable PP Resort being our clear pick of the bunch. It’s also the best signposted. Resort is pushing it a bit for this simple little guesthouse, but PP is a jolly good spot, whatever they want to call it. Bright orange painted, concrete chalets are set around a small car park, with a well cared for garden as well. Apart from the name, it’s unpretentious but attention and care have gone into PP. The dozen or so individual chalets all come with air-con and attached hot water... Read our full review of PP Resort.